The name Pecorino means “little sheep” and is perhaps more widely associated with Pecorino cheese, which is made from ewes’ milk and is entirely unrelated, save for its etymological link. The grape is so called supposedly because it was a favorite treat for flocks of sheep driven to lower pastures. Pecorino cheese is, coincidentally, a surprisingly good food match for Pecorino wine. And while it is true that the grape itself is thought to be very old, wines made from the Pecorino grape date only to about the 1990’s. Like so many grapes that have teetered on the precipice of extinction, Pecorino’s low yields had seen it replaced with more productive varietals like Trebbiano. In the 1980’s a local producer found some forgotten vines in an overgrown vineyard, he grafted them and set out to bring Pecorino back to life. The grapes can be naturally quite high in sugar, which may help explain their attractiveness for the wandering sheep, and the wines produced from them are frequently in excess of 13% abv. Luckily, the grapes are also blessed with naturally high acidity which helps to keep the alcohol in balance. 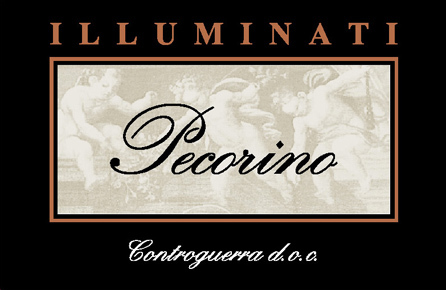 Illuminati’s Pecorino is fragrant and rich in ripe fruit and white flower tones, almond, field herbs and citrus. It fills the mouth well, powerful and very persistent: a correct balance between structure and softness, thanks to freshness and sapidity that accompany the long finish. A wine of a good longevity. Coincidentally, Pecorino cheese is a good match as well as seafood salads, fried zucchini blossoms, anchovies and king prawn skewers. Grapes are stemmed and very softly crushed; the must is statically decanted before being poured into thermo-conditioned stainless steel tanks to ferment at a controlled temperature ranging between 16° and 18°C. Approximately 10% of the must is fermented 4 months in barriques so to release a moderate “boisè” and a finer character.